Looking for a fun Halloween treat? Looking for something different? This treat is it. 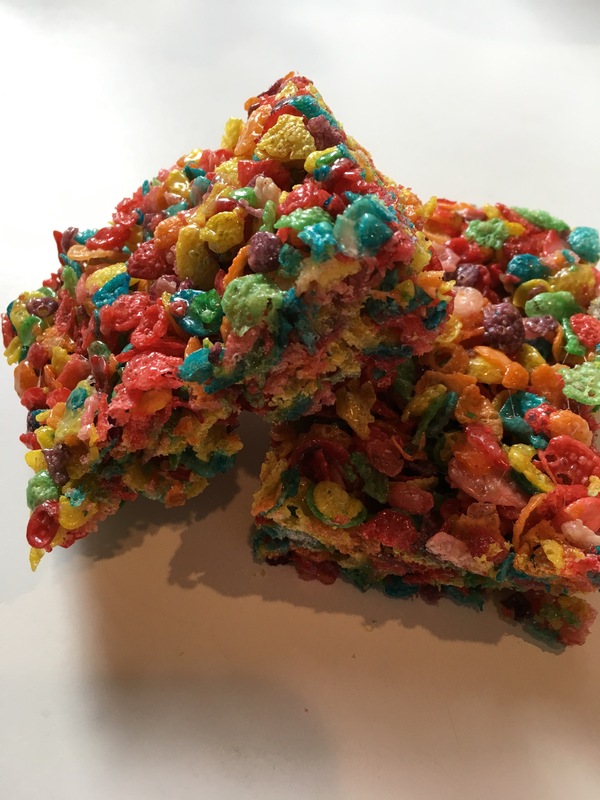 Similar to a rice crispy treat but packed with color and fruity flavor. With fruity pebbles now being labeled gluten-free this is a safe a addition to your next get together or exciting lunch box addition. Use a large pot because mixing the cereal can get very messy. Start by melting the butter over medium heat in the pot. Once melted, add the marshmallows and continue to cook over low to medium heat. Mix slowly until butter and marshmallows are fully melted and combined. Be careful not to burn or carmalazie the mixture. Once melted, remove from heat and add cereal to pot. Gently combine the mixture. Pour mixture into baking dish and gently press down. Any size dish works depending on how thick you want to cut the bars. Let mixture cool in pan for 45 mins. Finally, cut into bars or fun shapes. Enjoy! !